Dinosaurs are often depicted as giant, frightening beasts. But every creature is a baby once. 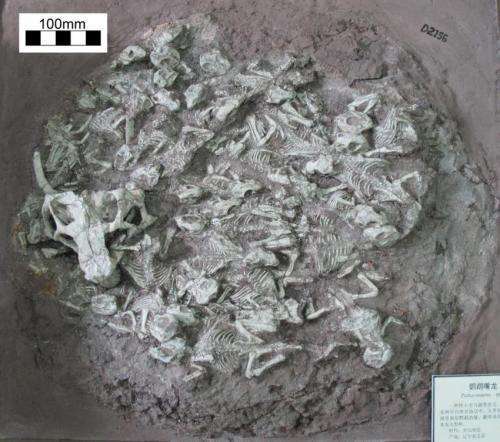 A new examination of a rock slab containing fossils of 24 very young dinosaurs and one older individual is suggestive of a group of hatchlings overseen by a caretaker, according to a new study by University of Pennsylvania researchers. Penn's Brandon P. Hedrick and Peter Dodson led the work, collaborating with researchers from China's Dalian Museum of Natural History, where the specimen is held. Hedrick is a doctoral student in the School of Arts & Sciences' Department of Earth and Environmental Science, where Dodson is a professor of paleontology. Dodson is also professor of anatomy in the School of Veterinary Medicine's Department of Animal Biology. Gomaa I. Omar of Penn's Earth and Environnmental Science was a coauthor of the paper, which appears in the journal Cretaceous Research. Amateur paleontologists came upon the fossils, which are about 120 million years old, in the Lujiatun beds of the Yixian Formation in northeastern China's Liaoning Province. Though the entire specimen is only about two feet across, it contains fossils from 25 creatures, all of the species Psittacosaurus lujiatunensis. Psittacosaurs were plant eaters and are among the most abundant dinosaurs yet discovered. The specimen had previously been described only briefly, in a one-page paper in 2004. The people who found and extracted the fossils did not record their exact original location, which hampers the investigation to some degree. But Dodson and Hedrick felt there was much more to say about the specimen. "I saw a photo of it and instantly knew I wanted to explore it in more depth," Hedrick said. To analyze the material in which the animals were preserved, the researchers examined thin slivers of rock under the microscope and samples of ground-up rock using a technique called X-ray diffraction, which relies on the fact that different kinds of minerals bend light in unique ways. Both analyses suggested the rock was composed of volcanic material, an indication that the animals were caught in flowing material from an eruption. The fossils' orientation supported this idea. "If they were captured in a flow, the long axis—their spines—would be oriented in the same direction," Hedrick said. "That was what we found. They were likely trapped by a flow, though we can't say exactly what kind of flow." Because there was no evidence of heat damage to the bones, the researchers believe the flow was likely a lahar, a slurry of water, mud, rock and other debris associated with volcanic eruptions. The 24 younger animals appeared to be quite similar in size. Though the team considered whether they might have been embryos, still in their eggs, various observations suggest they had already hatched. First, there was no evidence of eggshell material. Also, other paleontologists have identified even smaller individual psittacosaurs. And finally, Hedrick said, "the ends of their bones were well developed, which indicates they were capable of moving around." The larger skull was firmly embedded in the same layer of rock as the 24 smaller animals. Two of the younger animals were in fact intertwined with the skull, signs that the animals were closely associated at the time of their death. The skull's size, about 4.5 inches long, indicated that the animal was estimated to be between 4 and 5 years old. Earlier findings suggested that P. lujiatunensis did not reproduce until 8 or 9 years old, so this creature was probably not the parent of the younger dinosaurs. Given the close association of the young P. lujiatunensis with the older individual, however, Dodson, Hedrick and colleagues believe this specimen may offer evidence of post-hatchling cooperation, a behavior exhibited by some species of modern-day birds. The older juvenile may well have been a big brother or sister helping care for its younger siblings. The researchers emphasize that they can't definitively call this assemblage of fossils a nest, as some earlier analyses have. "It certainly seems like it might be a nest, but we weren't able to satisfy the intense criteria to say definitively that it is," Hedrick said. "It's just as important to point out what we don't know for sure as it is to say what we're certain of." As a next step, Dodson and Hedrick are examining the microstructure of the bones of the smaller animals to establish whether they were all at the same stage of development, which would lend support to the idea of this being one clutch of animals.